These encouragements are meant to improve internal team cohesion and support positive user activity. Below is an overview of these encouragements. Now you and your team will be reminded of teammate birthdays. Soon you won't forget to salute your fellow team members on their special day. The more diagnoses that are entered by your Veterinary team, the smarter EveryPig becomes. 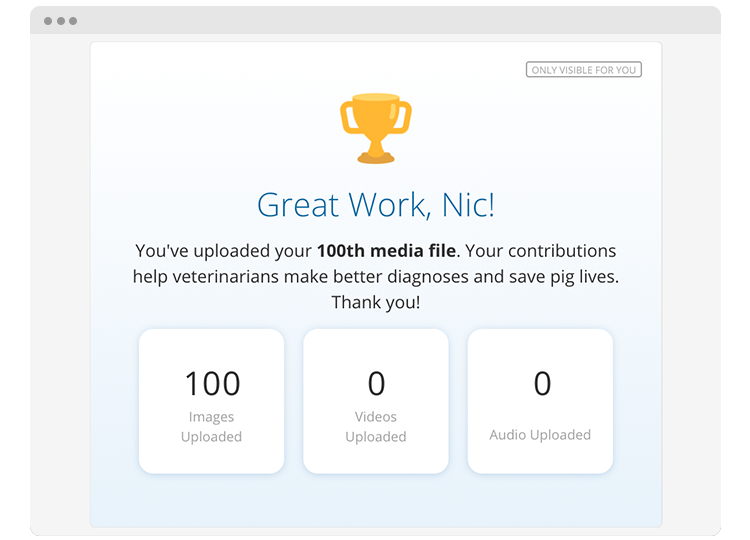 To encourage more diagnoses, we now help keep track of their diagnosis count and give subtle congratulations when a vet reaches certain milestones. 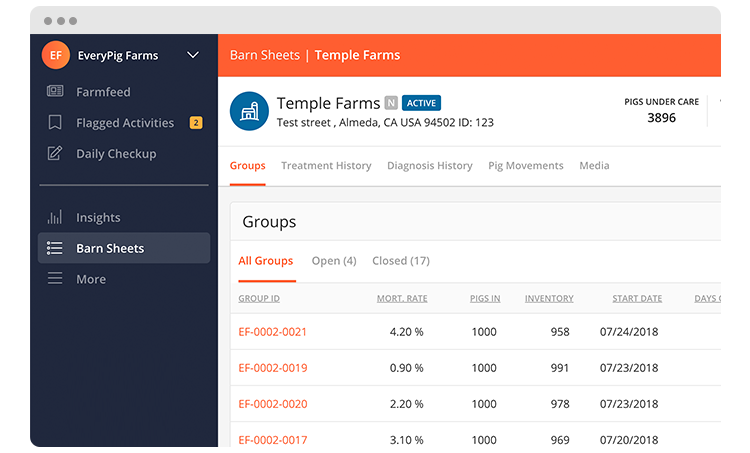 We now allow you to review Farm-Level data on the Barn Sheets much the same way as you can review Group-Level data. The Farm-Level Barn Sheet now has the following convenient tabs: Treatment History, Diagnosis History, Pig Movements, and Media. We released a feature that congratulates users when they reach predetermined milestones. e.g., the number of media files uploaded or the number of diagnoses submitted. Now EveryPig will keep track of your and your colleagues birthdays. This feature aimed at sparking team cohesion. We've added a Federal Premise ID to the data admin users can save to a farm. The More menu for mobile devices was updated so that it is easier to navigate. The Farm-Level Barn Sheet now has the following convenient tabs: Treatment History, Diagnosis History, Pig Movements, and Media. We have improved the readonly daily checkup. Now the user can see what was entered on a Daily Checkup without an additional click required. We've added the ability to Find and Replace group names. This feature is available on the Group Admin section. The group closure user experience has been updated. Now when a group is requested closed, it remains available to users for the current day. The previous version would not allow users to complete the Daily Checkup after asking it to be closed. Fixed a bug that prevented users from editing notes in edit mode. Fixed a bug that prevented some users from logging in on Android 6.0.1. Fixed a bug that prevented the app from switching language preference after the user completes registration. Older PostSeptember Release Notes 2.0: Get Ready To Share Farmfeed Events And More!